The Biblical story this Sunday will bring us to the region of Sodom and Gomorrah. These legendary cities are famous for their sinfulness. But it is a different sinfulness that many might think! Those who associate these two cities with homosexuality show themselves to be redneck ignorami. Firstly: I wrote about this a year ago, homosexuality as such is a modern concept. If anything is under judgement in the Bible, it is not same gender attractions or love, but sexual violence! Secondly: Violence as the main factor behind this story is confirmed by a biblical parallel with an almost identical plot in Judges 19; there the brutality is heterosexual. Anyhow, both stories, in Genesis and in Judges, are not primarily about sexuality but about grave violations of the sacred code of hospitality and protection of strangers. In the classical Greek world these rules were called Xenia and if the strangers were gods in the disguise, they called it Theoxenia. Thirdly: The importance and influence of Xenia and Theoxenia is further illustrated from and confirmed in Greco-Roman literature. The closest classical parallel to Sodom and Gomorrah is the story of Baukis and Philemon as recorded by Ovid in his Metamorphoses. Baukis and Philemon, an elderly and poor couple one day welcomed two strangers after these weary pilgrims had been turned down by every other house in the town. The old couple offered their guest the best hospitality they could afford. And although the guests were feasting, the supplies were not running out. Thus the elderly couple started to suspect that they might have been visited by some divine guests. When they wanted to offer them their only goose, it ran for protection into the lap of one of the guests. 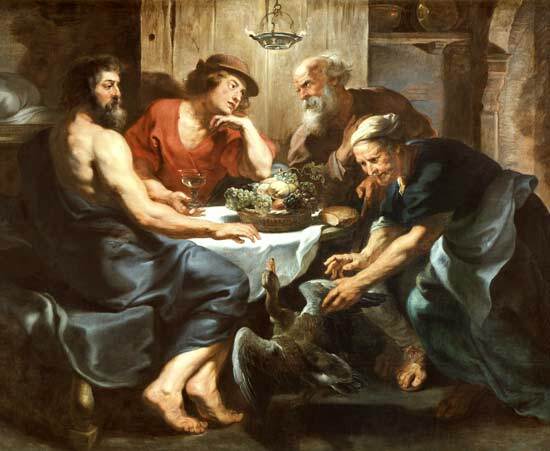 At that point their guests put aside their disguises and revealed themselves as Zeus and Hermes (Jupiter and Mercury). Immediately the divine guests instructed the couple to leave the town and seek shelter upon the nearby hill. When they looked from the top, the entire valley was destroyed by a flood in a punishment for the inhabitants’ lack of hospitality to gods. The generous couple was granted long life together and further divine rewards and at the time of their death they were transformed into an intertwined oak and linden trees. Thus both the biblical as well as the ancient texts clearly show, that the crime of the proverbially sinful cities was a violation of the sacred rules of hospitality. The deadly sin of Sodom and Gomorrah was not rooted in any form of sexuality but in what we now might call xenophobia, the fear or even hatred of strangers. All of this is just an introduction to this Sunday’s biblical stories (Both from Hebrew as well as from Greek Testaments). They will show us the mystery of meeting god in strangers (theoxenia), how we can react and what is the proper way of extending our welcome and hospitality. And for those who read this far: It is possible that Ovid might be dependent on the story from Genesis (the Genesis story was certainly older and Ovid might know it). On the other hand, the concept of theoxenia is well documented in classical literature. Also individual aspects of Ovid's story are so arranged that any direct influence is improbable. Most likely Ovid and Genesis are independent reworkings of some original oral version. The story in Genesis is more heavily edited and developed into a more complex story - human characters are split between two couples (Abraham and Sara and Lot and his wife). Escape from the city and observation of the valley in Genesis is also divided and multiplied into observation before and after the catastrophe. Ovid clearly follows more simple and closer to original narrative line than Genesis. Biblical doublet in Judges 19 is an example of historicising (transforming into history) of an older legendary (mythical) story. Most likely it was part of a political spin of Judeans at the time of composition of Judges to justify their violence against the tribe of Benjamin - "they made us do it because of their Sodom-like behaviour". When you visit Lyman House in Hilo, Hawaii, a mid XIX century missionary residence turned museum, most likely you will be proudly shown one preeminent mission instrument. There it lies, just as it was shipped and delivered from the missionary hotbed of New England, you can behold one of the early specimens of the Singer sewing machine. Don’t laugh, this was a serious spiritual business! Judging from the activities of early Congregational missionaries, they heard twofold indivisible high callings: A) to save the souls of depraved pagans (this is their language, not mine! ), and B) to cover the naked bodies of Sandwich Islanders (Hawaiians) with the proper Victorian attire. This is not just a funny anecdote of mixing bigot faith with cultural prejudice. Unfortunately, in its time it had sinister consequences. During this “divinely” sanctioned endeavor of naked-bodies-clothed and souls-saved-from-hell, the local population declined by about 80% due to epidemics, exploitation, and famine. When the American missionaries arrived there were more than 200,000 Hawaiians. In six decades, when missionary children (yes, they were predominantly direct descendants) misappropriated the islands for the American empire (overthrow of constitutional monarchy in 1893 and then military occupation in 1898), there were only 40,000 locals left! Can you imagine the magnitude of this national tragedy! And it hardly registered in missionary reports and dispatches! 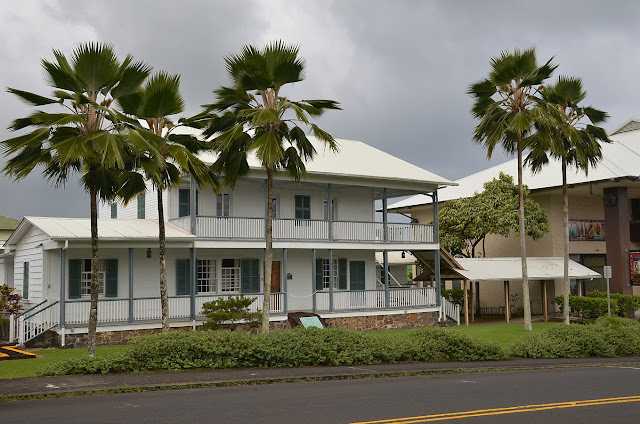 For several years it has been my anthropological hobby to study the history of Hawaiian religion (the original one as well as this transition to Christianity). After reading about it and studying it on the ground, I still do not know whether the missionaries were more, Christian bigots, cultural chauvinists or agents of an ascending empire (under cover of religion). Most likely all of it inseparably combined. Thankfully, around the time of Albert Schweitzer, Europeans first, later Americans, started to change mission gears. Finally, the main American denominations in the last decades of the 20th century, especially after the civil rights movement, went through thorough soul-searching, repentance, and rethinking of their mission endeavor. The changes in course and ethos were epochal. The international mission which is being sponsored by the mainline American denominations is not any longer what it used to be (and unfortunately still is with some evangelical zealots). Come this Sunday to meet Dr. Martha Sommers, a physician missionary in Malawi whose mission our church supports. Come to see and hear how completely different and more aligned with Jesus’ spirit the mission work is done these days! It is a mission without religious prejudice, without sewing needles, without Singer machines but with X-rays machines (as antiquated as they might be), syringes and donated medicines and most importantly real compassion. Direction is right, material challenges persist. Learning from our missionaries, supporting their work, we can make a real difference in life and health of entire communities and literally save lives. A bronze plaque commemorating the builders. ABCFM stands for "American Board of Commissioners for Foreign Missions"
it is still active mission arm of the UCC. 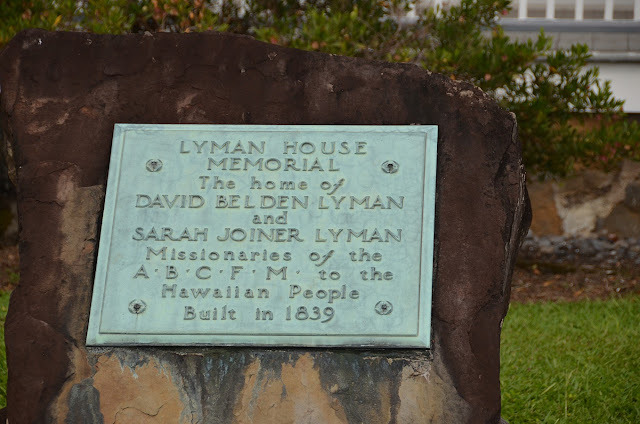 And by the way, the Lymans made fortunes in sugar plantations and careers in US military - for instance Hilo airport is named after Brigadier General Albert Lyman. Good old Samaritans still exist! But barely. There are just a few hundred left. Of course I do not mean it here in the idiomatic sense as “a kind person who helps another in difficult situation.” I mean it in the literal sense of Samaritans as an ethnic and religious group. They still live near ancient Samaria, approximately today’s Nablus, on the slopes of Mount Gerizim. They still worship there and offer ancient old sacrifices there as prescribed in the Law of Moses. Yes, indeed, they still read from their version of Torah - the Books of Moses. Their version of the Law is similar, yet different from our current Jewish and Christian bibles. The biggest difference has been that the Samaritan Law expressly requires worship on Mt Gerizim while the Jewish Torah speaks about “the place which the LORD will choose” (which later tradition interpreted as Jerusalem). Modern academic scholarship oscillates in opinion between which version is original, Samaritan or Jewish. I am convinced that both biblical versions (Samaritan and Jewish) are more or less simultaneous (early Hellenistic) and were edited to suit ideological desires of each particular faith community. Most likely the Samaritan reading about Mt. Gerizim is closer to the original, while the Jewish version was falsified thus enabling the Jewish religious center to be placed squarely in Jerusalem. From that time on the ancient ethnic and religious tension was born and only grew. When shortly afterwards the Jewish (Maccabean) King John Hyrcanus destroyed the ancient Samaritan temple on Mt. Gerizim it certainly did not help their mutual relationships. Proverbial animosity matured and still persists millennia later. In the state of Israel, Samaritans, as old as their religion might be, operate without the status of a recognized religion. Samaritans always were those quintessential others. Similar, but different; following the Law of Moses, but a different version; with faith in YHWH, but with different accents. They were a constant reminder of the diversity and plurality of faith/faiths. Jesus and the early Christians marvelously picked up, highlighted and embraced this theme. Unfortunately the church lost this diversity message soon afterwards. This Sunday and next, stories about Samaritans will remind us (it is needed again and again) that we are not the only people of faith. God does not belong to us alone, to church, to any church! Any religion, including our own, does not have an ownership license for God. So there might be only 700 or so real old Samaritans left, but the world is full of Samaritans, those quintessential others. They do not belong to our group (because many of them might have been alienated, offended or hurt by the church just like Samaritans were by Jews) but they still search and long for and, indeed, are loved by God. Come to celebrate this miracle of miracles!